Students at Huband Park Elementary got another lesson in food literacy from nutritionist Shannon Simpson. Food literacy is becoming more important to empower young learners with the knowledge to make healthy choices that can fuel the brain as well as the body. 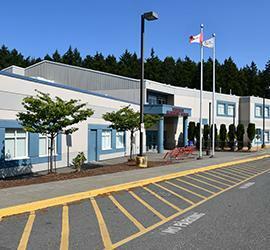 To learn more visit Healthy Schools BC. Calling all young women across B.C. to take part in a challenging and adventurous education opportunity this summer on Hornby Island. Registration for the Ocean Literacy Leadership Camp is open now. Learn more about the camp from last year's participants here. Grandbuddies in action! Ecole Robb Road students paired up with their senior buddy for an afternoon skate - one of many monthly outings or activities with the residents at Glacier View Lodge. Watch the program in action on our YouTube Channel. Bringing the classroom outdoors. Ecole Puntledge Park students participated in a nature walk along the river to learn about their surrounding natural community - one of the many district initiatives around Environment and Outdoor Learning. To find out more about EOL, click here. Ecole Robb Road has transformed their library into a natural learning environment with the help of artist Jason Craft. Students K-7 inspired each element of artwork based on the local surroundings and wildlife indigenous to the Comox Valley. A big thank you to the PAC for helping fund this clever endeavour. The Trades Sampler at G.P. Vanier class took part in valuable outdoor learning with Caitlin O'Neil (Current Environment) focusing on working in sensitive habitats. Students visited Brooklyn Creek restoration project, culvert installation at Roy Creek and at Millard and gained knowledge about water diversion, contamination prevention and spill mitigation among other leading issues in today's trades industry. Eleven teams representing six Comox Valley schools competed in the annual Provincial Destination Imagination (DI) Tournament Saturday, 6 April in Vancouver. Two G.P. Vanier teams took home provincial champion titles, including DInamic for the Engineering Challenge. Students at Airport Elementary are asking that question. This month, as we celebrate Earth Day, students are participating in learning opportunities about the environment from sustainable practices to waste reduction at school. National Volunteer Week is a great opportunity for us to acknowledge our dedicated parent and community volunteers. Indigenous Education volunteers were among the many celebrated for the work they do around reconcili-ACTION in our classrooms, programs and culture. View more images of the appreciation dinner on Flickr. Secondary students belonging to the Youth Environmental Action group engaged in thoughtful, positive dialogue with all Comox Valley municipal leaders to share ideas and form an alliance toward sustainable solutions for an environmentally sound future. More coverage on the media can be found at My Comox Valley Now. Sixty of our young students participated in the district Pro-D day February 15th, the day Comox Valley Schools unveiled its official song A̱m’lala sa Ḵ̓umux̱se’ To learn more visit Indigenous Education here. For more images and video visit us on Flickr. Aspen Park #learn71 kids are having fun coding with the help of our district Information Technology Support Teacher, Kara Dawson. Find out more about this initiative in our new video series, Eye on Education via YouTube. 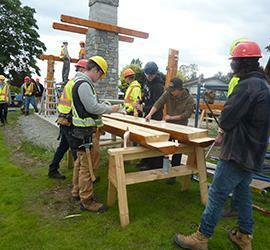 Mark R. Isfeld hosted their 3rd annual Eco Fair and invited several local community groups dedicated to sustainable practice to showcase ideas and initiatives. If you are a student or member of the community with a passion for environmental concerns, consider joining or lending a hand to one of our secondary schools' environmental clubs. 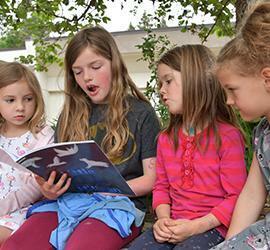 Here at Comox Valley Schools, we are a learning community that embraces diversity, honours relationships and prepares all learners for a changing world. A core element of our vision is inclusive and responsive community engagement between the Board of Education and public education stakeholders in the Comox Valley. 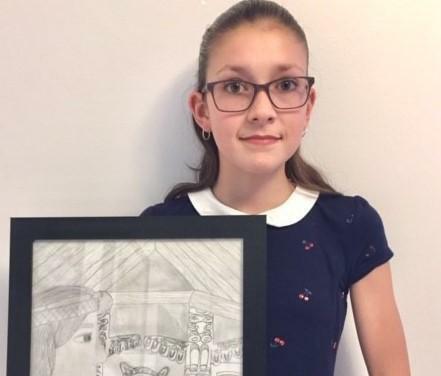 A Brooklyn Elementary Grade 7 student received surprising news about her artwork submission into the Imagine a Canada competition. As a result of her compelling story of why she demonstrates leadership in reconciliation, Dani Lewis was selected as a regional honouree for the Imagine a Canada National Arts and Leadership Initiative through the University of Manitoba. Erin Haluschak, Comox Valley Record, sat down with Ms. Lewis to learn about her vision for reconciliation and her Indigenous family heritage. 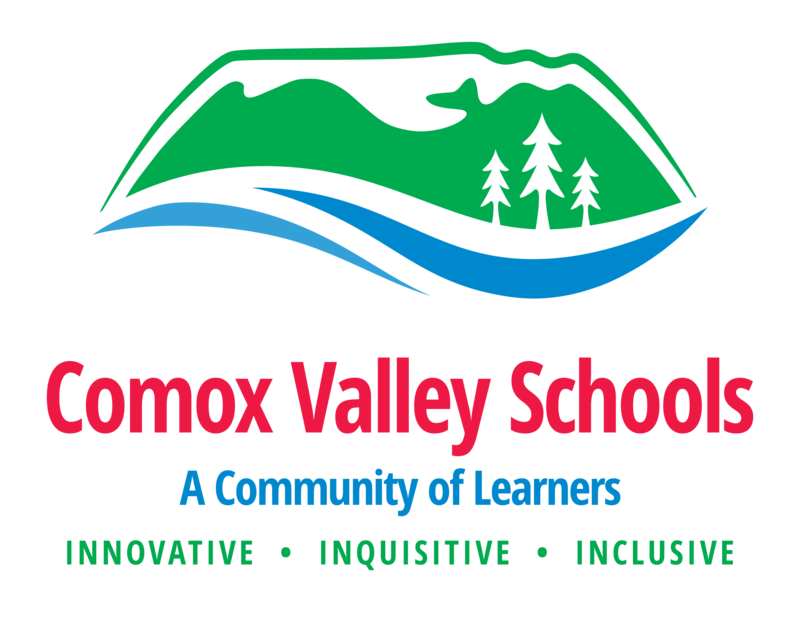 Comox Valley Schools is pleased to announce the position of District Principal: Student Services has been accepted by Ms. Tracy Pederson. Please join us in congratulating Ms. Pederson into her new role with the district. 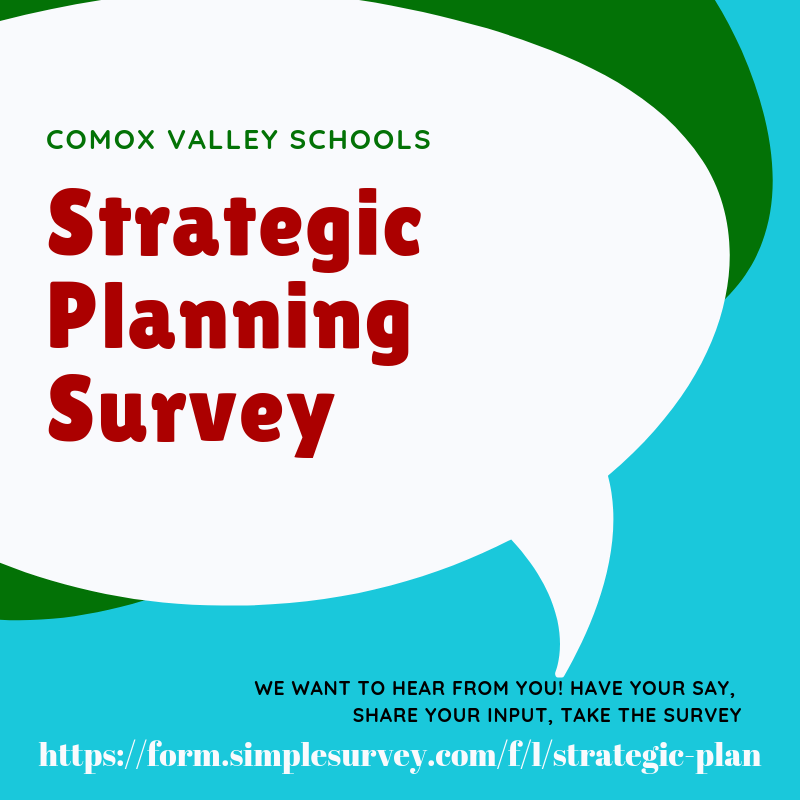 Comox Valley Schools is currently creating a strategic plan for the 2019 – 2023 school years. In our development of a new strategic plan, we review our past strategic plan as well as seek consultation from our education partners and members of the community (parent/guardians, students, staff, and the general public). This survey is the first part of the consultation process. 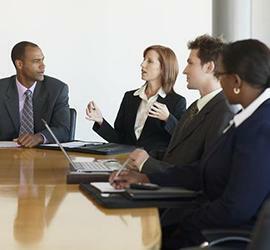 Please take the time to complete a few questions and share your valuable input. The survey will be open until April 24th.